I made a barbeque in my yard on SUN as the weather continues to be unusually warm in Romania for this period of the year, we are still enjoying 28-30 Celsius degrees. 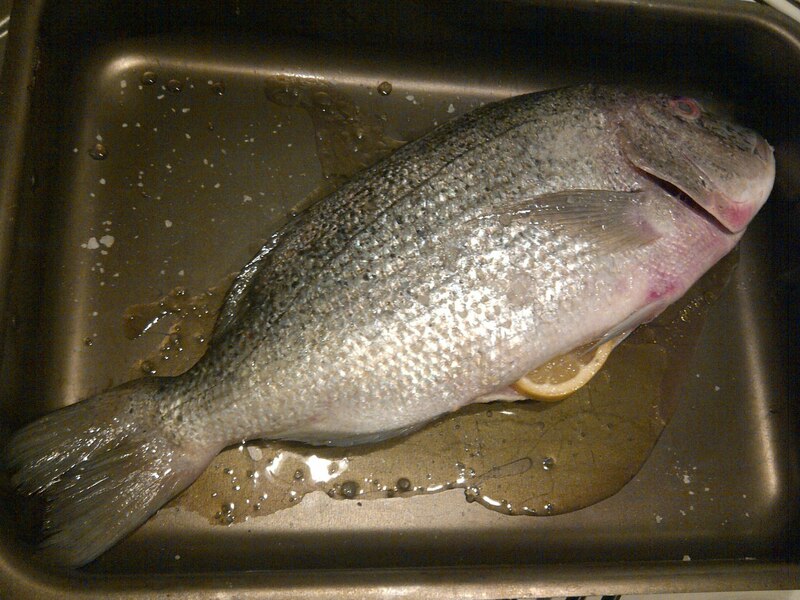 I had another prime fish that I bought this week: this time a 1 kilo Dentex that took almost 45 min to cook on the grill, but the result was fantastic. 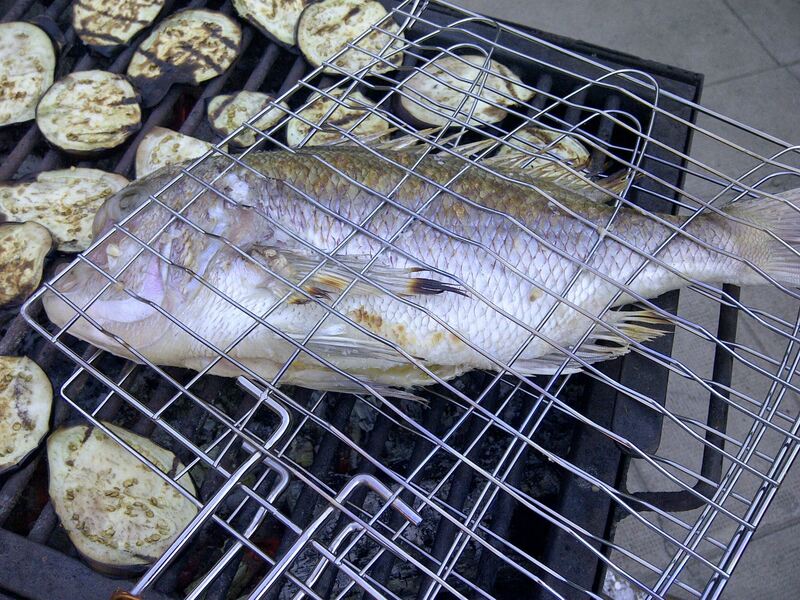 With a dressing made of some olive oil and lemon juice, the fish meat is perfect. 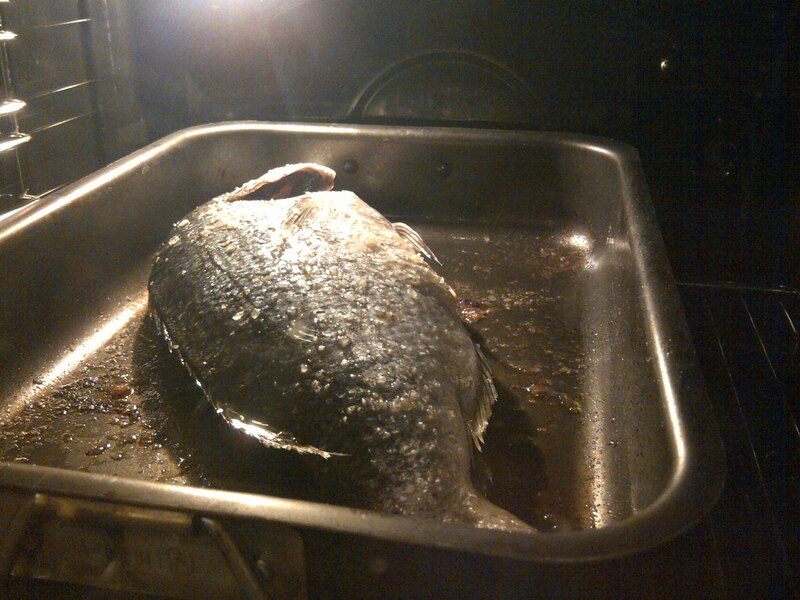 A few slices of lemon put inside the fish will give a nice citric flavor. Paired with a variety of grilled vegetables this was an unforgettable lunch. I wanted to choose a good wine and this was a good opportunity to check how the white Rezerva from Davino evolves now at 3 years from the harvest. 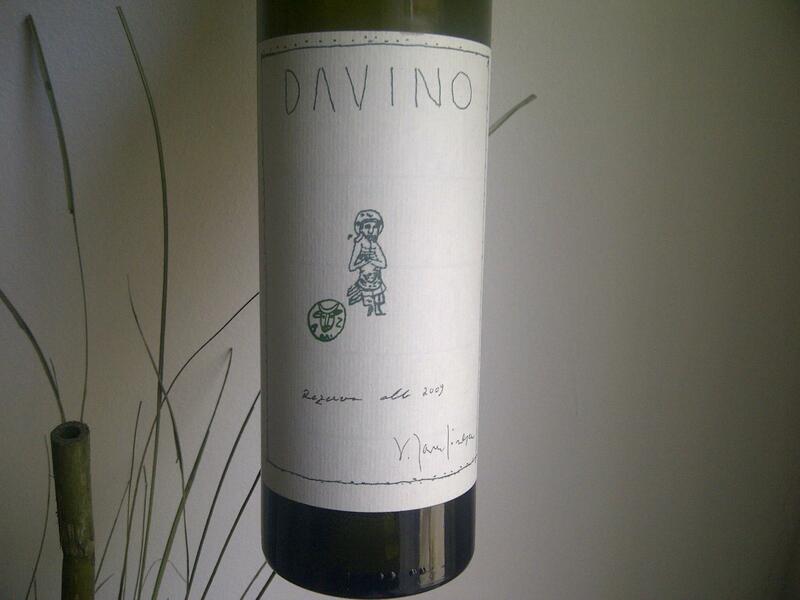 This is Davino’s top white wine. Blend of Italian Riesling and Sauvignon Blanc, aged less than 1 year in Romanian oak. The Riesling gives good structure and the Sauvignon Blanc very nice aromatics. I tasted this wine about 3 times in the last 11 months and there is a significant evolution. Last year in November-December the wine seemed a bit closed, with pronounced oak flavors and the acidity not showing its best. Then, in March-April it started to open up but still not in the right place. This is always a great wine from a reliable and Old School Rioja producer. 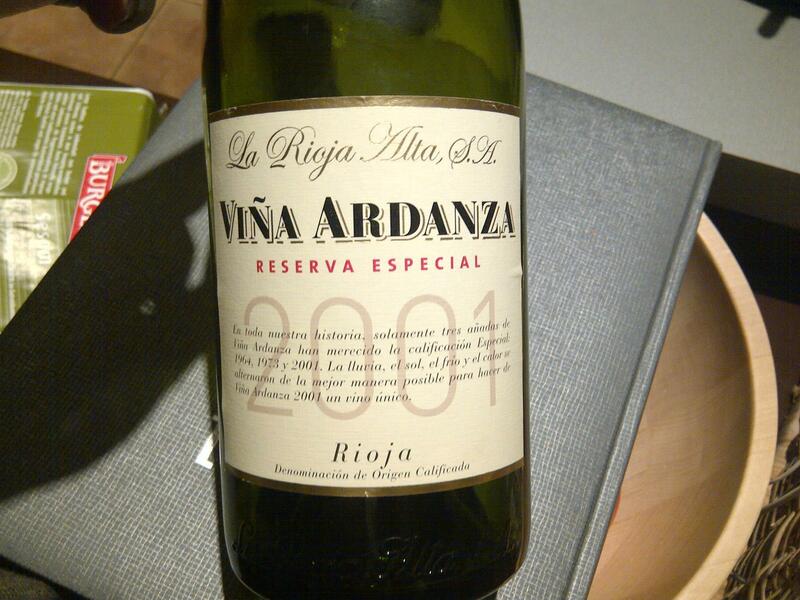 As the front label says Vina Ardanza was named a Reserva Especial only 3 times so far when the vintage conditions were perfect: 1964, 1973 and 2001. It costs about 21 Eur in any hypermarket in Spain. 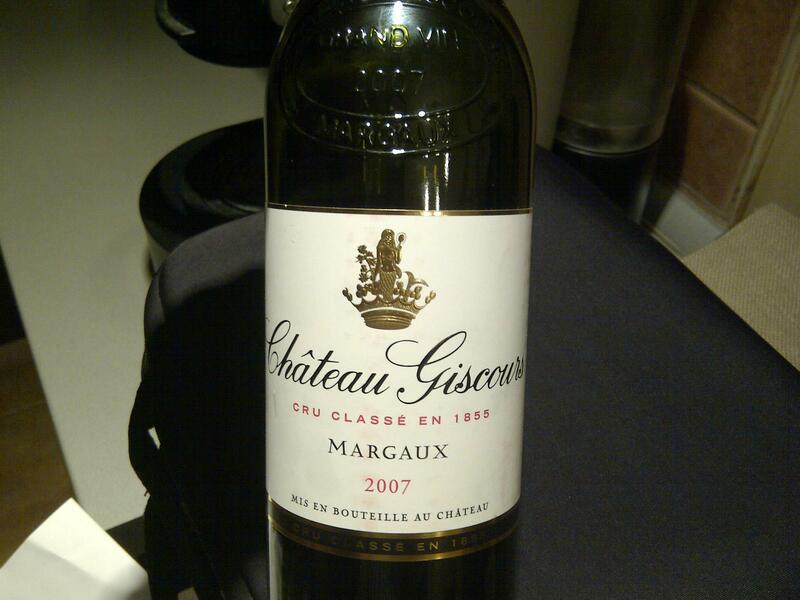 I had this wine several times in the past couple of years and I loved it from the beginning. There are signs of evolution on the 2007, at least from the color perspective compared to one year ago, but otherwise the wine continues to be really good. There was no planning to open this bottle, especially not on a MON evening but, as I bought some fresh fish from a person that brings it straight from Greece, I had to pair the prime quality fish with a good wine. It’s a pity to serve good food with mediocre wines. 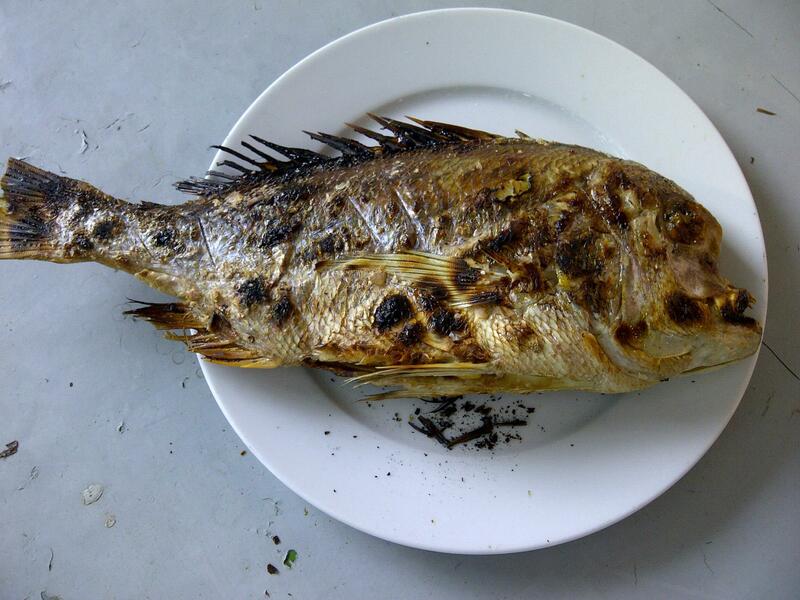 The fish selected for dinner was a wild Dorado (about 1 kilo) slowly cooked in the oven for about 1 h. I just used some slices of lemon, olive oil and salt as this type of fish doesn’t require anything else for preparation. It is very tasty on its own. I did add some cherry tomatoes spiced up with thyme towards the end of cooking just to have some side dish: the fish is rather sweet while the baked cherry tomatoes make a good contrast being juicy and bringing a higher acidity to the dish. For two persons it was more than enough. With the wine it was a bliss. I received two bottles of Domaine Ceptura Rouge 2010 and 2009 last week from DAVINO to entertain an academic exercise and compare the two wines. It is important to mention that Domaine Ceptura Rouge 2010 will probably be released on the market not earlier than the spring of 2013. That means that the wine ages in the bottle anywhere between 8-12 months prior to its release. Domanine Ceptura Rouge is a blend of Cabernet Sauvignon, Merlot and Feteasca Neagra aged for 8-10 months in new Romanian oak barrels. Perhaps the title is a bit tricky as both wines maintain the continuity in style and quality that DAVINO managed to build over the years. Perhaps what puts 2009 on a higher scale is the advantage of benefiting from an almost perfect ripening season. As stated before, 2009 was the best vintage over more than 20-30 years in Dealu Mare, having the right conditions at right time. The wines have lush fruit and fully ripe and sweet tannins. 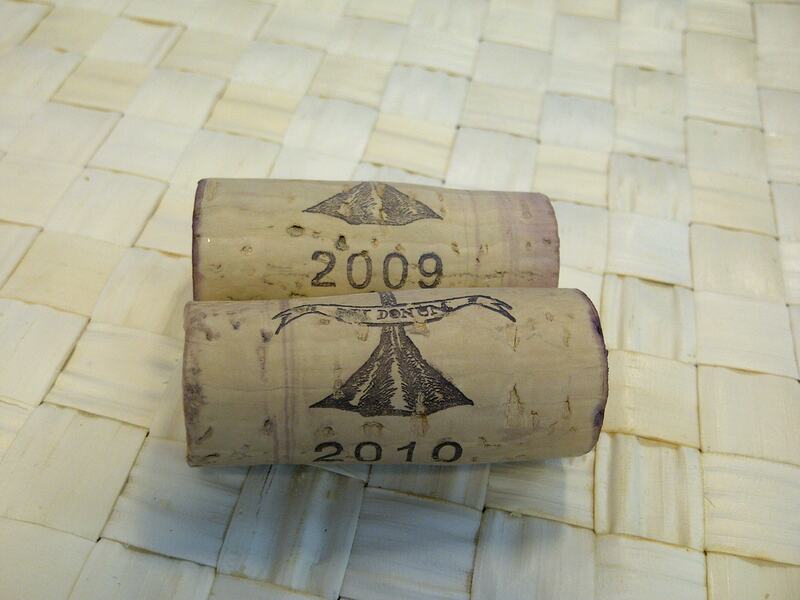 The 2010 was a more capricious vintage than 2009. However, rigorous work in the vineyard and keeping the yields low produced good quality fruit. Both wines show good structure and balance, intense aromas and flavors and a medium to long aftertaste. Both wines have enough complexities to make them enticing. There is however a slight difference between the two vintages, as 2009 seems to possess voluptuous fruit – without being tiring or too much, on the contrary, the lush flavors and the fully ripe tannins make it extremely approachable and pleasant to drink already. What never stops to surprise me is how well it evolves on the second day after uncorking it, showing a more complex nose and more interesting flavors (appealing truffles aromas), retaining its freshness in spite of all its extraction. There is a real potential for evolution for this wine and, as tempting as it is to drink it now, do try to save some bottles as in 3-4 years this will be even better. I always enjoy it more on the second day. This is usually the characteristic of a great wine, to be better as it gradually opens up on the following day. 2010 exhibits a higher acidity making it fresher, with a suppler body, but still retaining the intense flavors and the structure. It certainly feels younger, but still elegant. I am rather sure that these additional 6-8 months of aging in the bottle will make it rounder and more harmonious. We find the same extraction that marks DAVINO’s style and I believe that 2010 will probably take more time to be as accessible as the ripe 2009. There is unquestionably a consistency in style for Domaine Ceptura Rouge and this was even better highlighted by a vertical tasting of 6 vintages of DCR organized by Vinexpert last year. These two recent vintages only confirm this style and success. 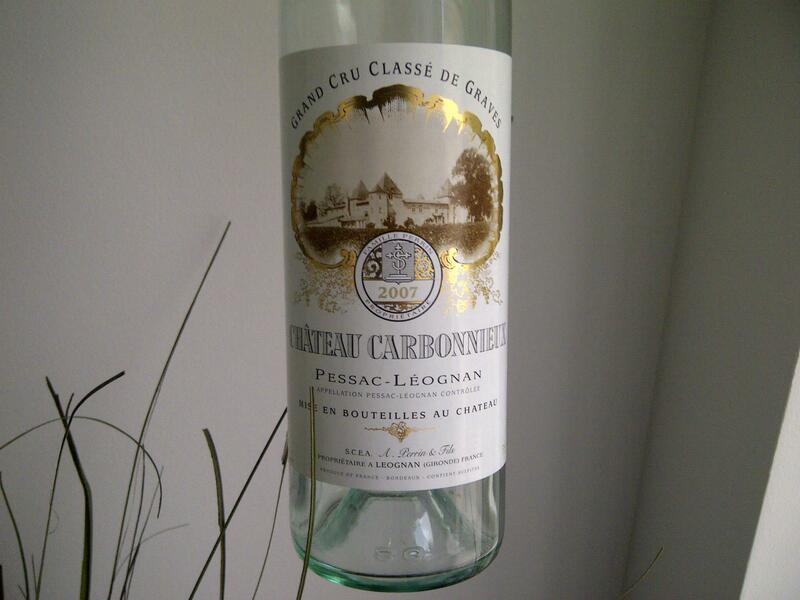 2007 was not a generous vintage for red wines in Bordeaux, it was certainly much better for the whites. Usually, the 2007 reds had unripe fruit, with herbaceous aromas, are rather thin on the palate, but the good part is that many are ready to drink already. There are certainly exceptions, but generally speaking that is the mark of the vintage. I guess the problem with 2007 is that the quality is lower than the 2006 but the prices were a bit higher. So in many cases 2001 and 2004 can be better value for money, as the prices were much lower before the 2005 vintage. Consider your options and choose wisely. Older Romanian wines are, unfortunately, a rare commodity, but 5 or 7 years from now the situation will probably change based on the number of wineries that were launched over the last couple of years and hopefully they will understand that it is important to keep a small stock of each vintage at least for the academic exercise of seeing how your wines evolve in time. I am pretty sure that consumers that love your wine will also appreciate to have the possibility to buy older wines long after the vintage. There is also the risk that, knowing that your wine cannot age, why keep a stock of it ? But then, why the high price ? 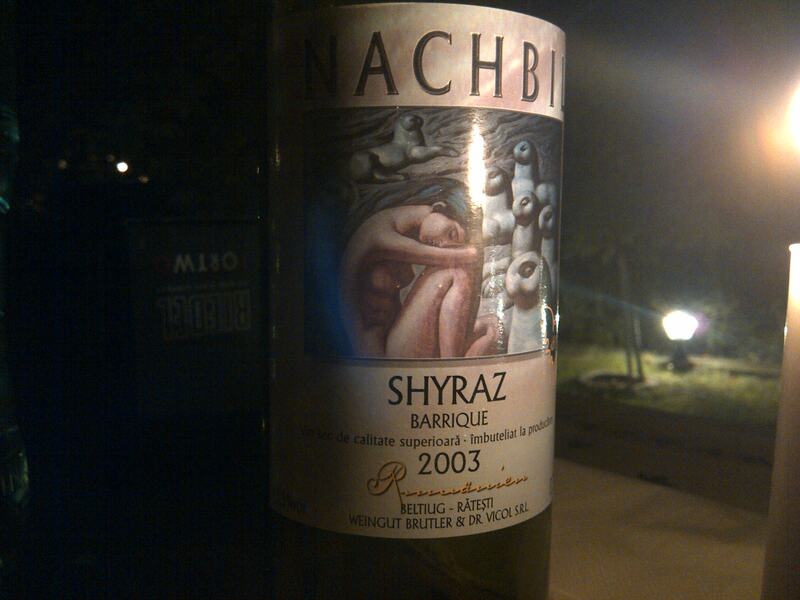 I read some reviews of the 2003 Nachbil Shyraz Barrique tasted by a few of my Romanian wine bloggers colleagues and these reviews are rather polarized. Some liked it a lot, others found it rather modest, not to say more. I will tell you my experience with it. The cork is very healthy and there is just a small 1 mm of it soaked in wine. So no worries about keeping it further from this perspective. After uncorking it, immediately poured, the wine is completely dumb and muted. It actually requires at least 3 hours of breathing in order to open up and reveal its true character. I made the mistake of not pouring it into a decanter and just left it to breath in the bottle. I would advice anyone that wishes to drink this wine to use a decanter and leave it there for at least 2-3 hours. The improvement is really sizable. Some of my colleagues that tasted this wine blindly scored it in the lower 80s/100. This is true if the wine was not aerated enough. But if you allow it the proper time, as mentioned before, the change is really sizable.